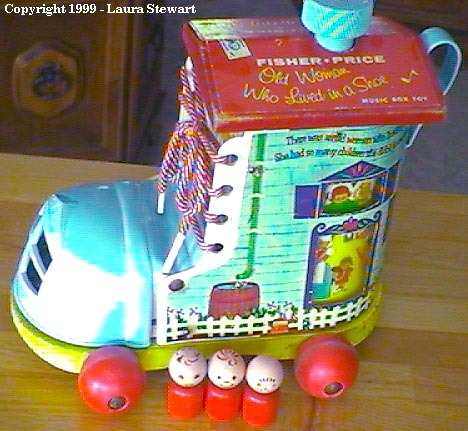 Description: The Music Box Lacing Shoe was the very first Original Little People set that featured a shoe-shaped base. 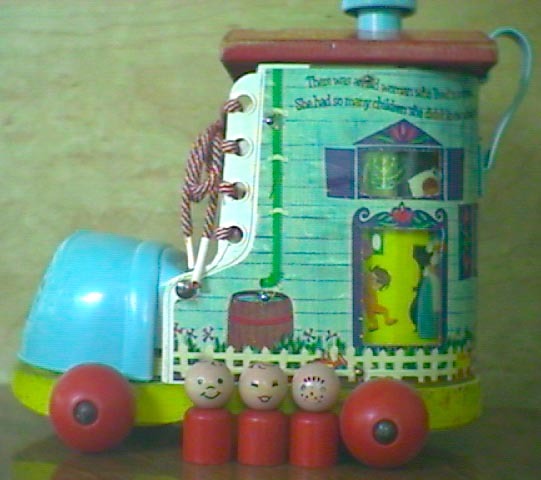 The shoe has a metal cylinder inside that revolves and plays, "Old Woman Who Lived In A Shoe". The wooden "chimney" on top winds the music box. The sides of the shoe has windows that shows colorful pictures from the revolving cylinder inside. The shoe has a red and white braided shoe lace that threads through the holes in the sides of the shoe to teach children how to tie their shoe. The shoe's toe is plastic and lifts up on a hinge to reveal a hidden section for the 3 accessory Little People figures to sit in. The shoe rolls on 4 red wheels with metal axles. B991 - Shoe with a yellow wooden base and a metal cylinder inside that revolves and plays, "Old Woman Who Lived In A Shoe". The wooden "chimney" on top winds the music box. The sides of the shoe has windows that shows colorful pictures from the revolving cylinder inside. The shoe has a red and white braided shoe lace that threads through the holes in the sides of the shoe to teach children how to tie their shoe. 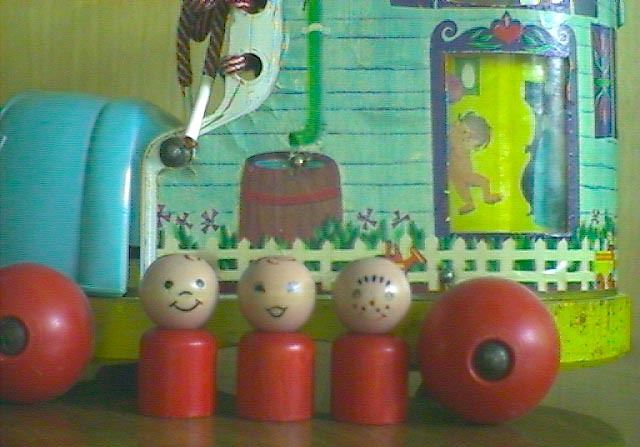 The shoe's toe is light blue plastic and lifts up on a hinge to reveal a hidden section for the 3 accessory Little People figures to sit in. The shoe rolls on 4 red wheels with metal axles. Overall size: 10" long, 6-1/4" wide, 8-3/8" tall. DFWW - Red boy smiling with freckles and ''' eyebrows. DEWW - Red boy smiling with red heat-stamped hair. GKWW - Red girl with fancy eyes, and a red bow in her "hair". The 1st was the #991 Music Box Lacing Shoe. The 2nd was the #136 Play Family Lacing Shoe, made from 1965 until 1969. Unlike the #991 or #146, this shoe does not roll on wheels, it sits flat on the floor. The 3rd was #146 Pull-A-Long Lacing Shoe, made from 1970 until 1975. This shoe looks almost exactly like the #136 shoe, except the lithograph on the sides is a bit different, and this shoe rolls on 4 plastic wheels.